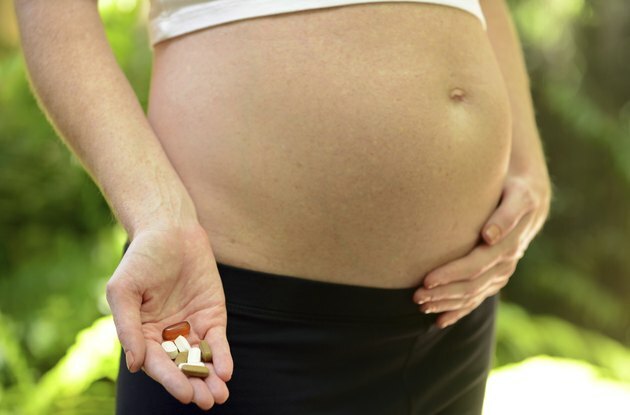 How Much Fish Oil Should Pregnant Women Take in the First Trimester? Fish oil is found in cold water fish, such as salmon, and also in supplements that can be made from whale blubber, cod liver, halibut, tuna and mackerel. Fish oil contains omega-3 fatty acids such as eicosapentaenoic acid, or EPA, and docosahexaenoic acid, or DHA. The American Pregnancy Association states that the typical American diet is lacking in omega-3 fatty acids, so finding ways to add fish oil to your diet in pregnancy is important. The amount that you need to take may depend on the source and your nutritional needs. Omega-3 fatty acids found in fish oil are important for development and not made by the human body. They help your body maintain its production of prostaglandins, a substance that helps regulate your blood pressure, transmit nerves and clot your blood. They also help with brain, eyes, central nervous system and heart development, and are especially important for your unborn baby's brain and vision growth. Omega-3 fatty acids may also help lower your risk of preeclampsia, which is characterized by high blood pressure during pregnancy. The American Pregnancy Association states that pregnant women need 300 milligrams of DHA every day. Medline Plus, an online resource of the National Institutes of Health, notes that 5.1 grams of fish oil with a one to five ratio of EPA and DHA is used for pregnant women with a history of past miscarriage. To find the best dosage and fish oil source for your health situation, talk to your doctor and follow his instructions. According to Medline Plus, fish oil is likely safe for use during pregnancy as long as you stick to your recommended dosage. Too much fish oil can keep your blood from clotting properly. If you get your fish oil from cold water fish, make sure you do not consume fish with high levels of mercury that could harm your unborn baby. Fish to avoid include tilefish, shark and swordfish. While searching for a fish oil supplement, read the label carefully to make sure you are getting a quality supplement that is not made from high-mercury fish. According to the American Pregnancy Association, a quality fish oil supplement does not have a fish odor. Look for supplements that also contain other nutrients, such as iron, calcium, and vitamins A, B-2, C and D.
How Much DHA for a Pregnant Mother? Is It Safe to Take Flaxseed Oil During Pregnancy?